NVIDIA today confirmed that TU106-based GeForce RTX 2070 will be available on October 17th. 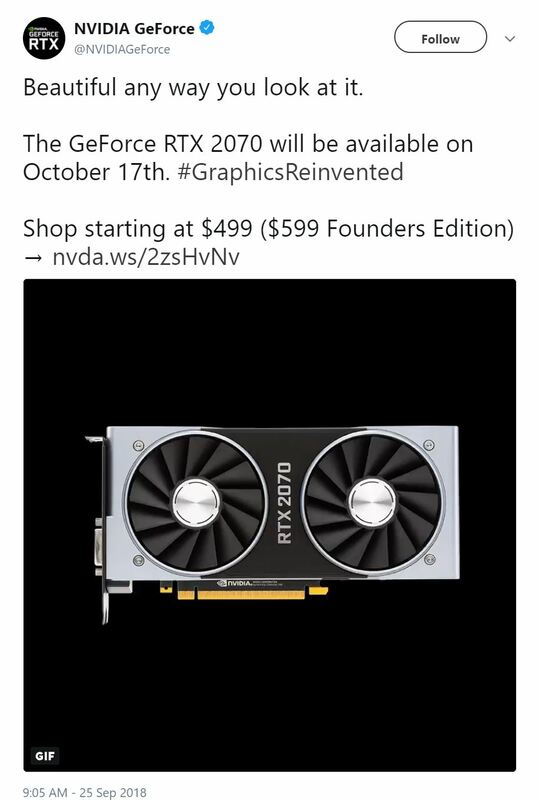 The GeForce RTX 2070, which is expected to retail at 499 USD (custom models) will be available on October 17th. The RTX 2070 is confirmed to be using TU106 GPU. This is, in fact, the only GeForce RTX model so far to utilize full GPU silicon (RTX 2080 Ti and non-Ti are both using cut-down chips). NVIDIA’s new RTX 2070 features 2304 CUDA cores and 8GB GDDR6 memory. The GPU is also equipped with 36 RT Cores and 288 Tensor Cores. The new X70 model is much more expensive than their predecessors. Not only that, the new model also lacks SLI support. Reviewers might (and should) explain that this decision was completely unjustified.